Highway officials said it could be a family of sasquatches. camera (Arizona Department of Transportation/Facebook) Arizona Department of Transportation posted this photo of a street Facebook, Jan. 1, 2015, with the caption: "We might have spotted a family of sasquatches on SR 260 near Heber this afternoon." A suspicious pack of what appeared to be a group of large animals has sparked a viral debate about a possible sasquatch sighting in Arizona. 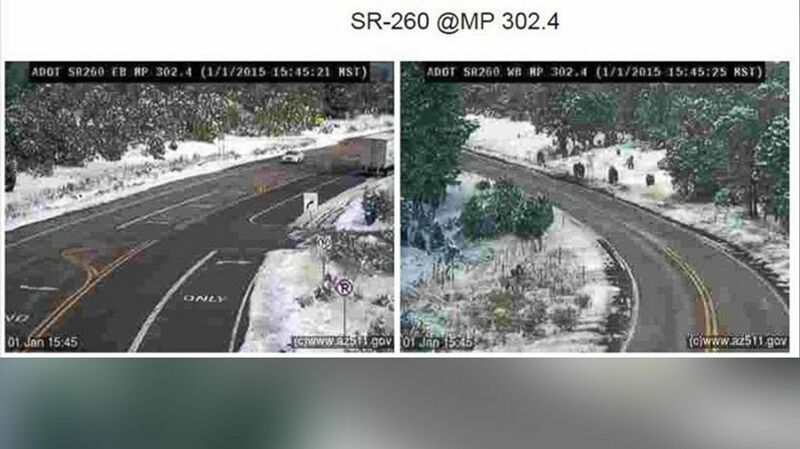 The Arizona Department of Transportation was behind the latest announcement -- and conspiracy theories began to grow after they posted a photo from a highway patrol camera. It wasn't Big Foot enthusiasts reading too deeply into a suspicious photo; the government officials were the ones to suggest that something sinister -- and mysterious -- was going on. "We might have spotted a family of sasquatches on SR 260 near Heber this afternoon. What do you think?" the Department of Transportation wrote in the caption of the photo it posted to their official Facebook page on Jan. 1. The post was shared nearly 3,000 times. The more than 2,000 comments ranged from true believers to those concerned with the well-being and supposed mythological powers of the rarely spotted beings, but eventually the department put the speculation to an end, admitting it was just meant to be humorous. "We always try to have a little fun with our Facebook and Twitter feeds," department spokesman Tim Tait told ABC News. "That way, we don’t just post news about crashes and road conditions, but a little something to engage our audience in different ways. This posting was one of those efforts -- something that caught our attention, and we thought it might make some people chuckle."